I am an English freelance underwater cameraman / videographer based in Thailand. With over 15 years' experience as an underwater cameraman, I take a great pride in shooting high-quality underwater video. Although based in Thailand, I will happily take on underwater video assignments overseas. I am within easy reach of south-east Asia dive destinations including Indonesia, Malaysia and the Philippines. I am now shooting with a Panasonic Lumix DMC-GH4 mirrorless micro four thirds camera in a Nauticam NA-GH4 housing. With this I shoot UHD 4K video. I have a variety of lenses and ports for this system to allow me to shoot from wide angle to super macro and everything in between. More on my equipment page. I am meticulous about camera steadiness, correct white balance, and balanced framing/composition, areas often lacking in underwater video work. I have been diving since 1986. I was one of a pioneering team of deep technical divers through the 1990's. In 1994 I dived the RMS Lusitania in Ireland in 93m and participated in the UK's first 100m dive in the Dorothea quarry in north Wales. In 1998 I led the expedition to HMHS Britannic, sister ship of HMS Titanic, lying in 119m water in Greece. This was one of the biggest wreck diving expeditions ever undertaken. As an underwater cameraman on this expedition I acquired unique DV footage of the great ship. In 1999 I gave up my career as a product designer to concentrate full time on scuba diving and underwater video. I am a qualified PADI Open Water instructor and IANTD trimix diver. 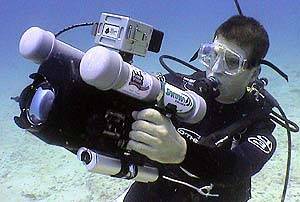 I undertake work as a freelance underwater cameraman, including TV and promotional underwater video work, underwater video surveys, as well as topside video and private commissions for scuba divers.